Earnest Augustus Bowles (1865-1954) was a leading horticulturist, botanical artist and garden writer of his day, accomplishments that were all the more remarkable as he wasn’t formally trained. ‘Gussie’, as he was known to his friends, introduced over forty cultivars of perennials many of which are familiar to us today. Two spring to my mind : the perennial wallflower Erysimum ‘Bowles Mauve‘ and Carex elata ‘Aurea’ (Bowles’ Golden sedge). As a long serving, highly respected Vice President of the Royal Horticultural Society he won the Victoria Medal of Honour, and, for his contribution to horticulture in general he is commemorated in ‘Bowles Corner’, RHS Wisley Gardens. He’s also left us with a riddle …. To try and solve it I’ve been reading his book My Garden in Summer, one of three seasonal journals published in 1914. Bowles and his friend William Robinson, were early pioneers of ornamental grasses and Bowles experimented with dozens of them in his Myddleton House garden. 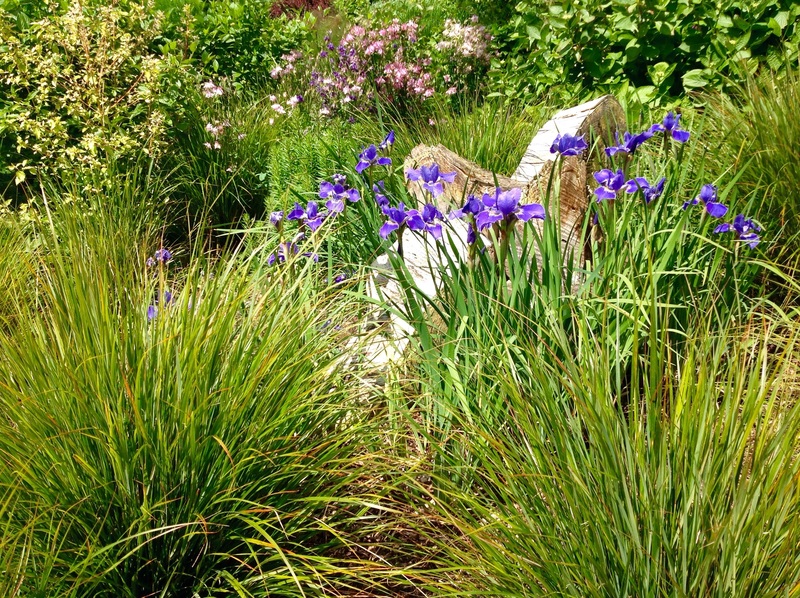 I’m intrigued to discover that among those he trialled was the New Zealand semi-evergreen Anemanthele lessoniana (syn.Stipa arundinacea), it’s a grass I know and love, not least because it grows so easily from seed. It’s commonly called Pheasant’s Tail grass, although Bowles was puzzled about its likeness, to him it looked no “more like a pheasant’s tail than a pig’s”. Over the last few weeks this grass has been coming into flower, its good looks start a debate among visitors. Does it look more like the tufts on the pheasant’s tail feathers before the flowers are fully open. Or perhaps it just the tints in its foliage? Between bouts of admiring it we get down to the brass tacks of growing it. Even if young plants don’t look as resplendent their parents, the sharply tinted orange-green foliage is an attractive feature. Grown in shade leaves are more uniformly olive green – less pheasanty, perhaps? After several years of loyal service this group are due for retirement. By winter they will look like this – thatch ridden but easy to dig up. Once the airy panicles are fully open, the debate resumes with gusto. Does the bronze-violet sheen of the mass of inflorescences resemble ihe iridescent plumage of the male pheasant’s breast? The shimmering effect, and the debate, lasts for a good few weeks, once seed sets the gauze turns tawny and the wrangling stops. The arching flowering stems are about a metre long, they have a habit of lassoing passers-by. In late autumn I dead head it, especially if it’s planted next to a narrow path. The spent stems pull away in great armfuls as easily as candy floss. In its prime, anemanthele is a behemoth, occupying a square metre of space. In this bed it’s completely engulfed the giant slices of Scots Pine. It looked rather different in May. In the centre of the above image, the anemanthele ‘hedge’ bordering the drive shows that the last two have failed to grow as well as their siblings, this is one of the joys of mass plantings. 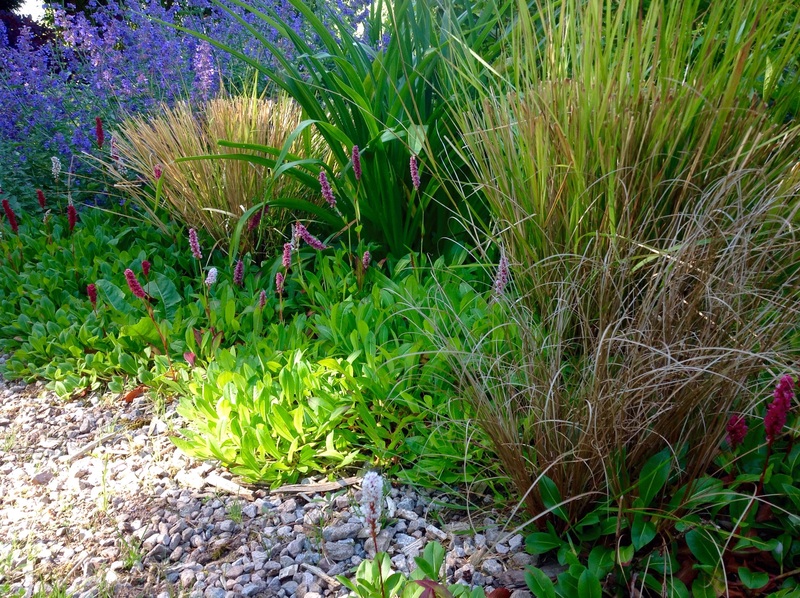 Annexed by Persicaria affinis ‘Superba’ they’re half-way to the compost heap. I cut back them back by a third in spring, last year’s straw coloured growth at that height is still visible. To maintain a bold scheme I’ve discovered it’s a good idea to have heirs and spares on standby. In the interim, I think the trick is to know when to cut mature specimens back and by how far – something I wrote about in a previous post Easy Evergreen Grasses. There’s nothing quite like a bit of schadenfreude to ease the misery of gardening; imagine my delight when I stumbled upon Bowles’ description of his own experience of growing the very same plant but known to him by a different name, Apera arundinacea. At one time I grew Apera arundinacea very well here, and its wonderfully long hanging heads and bronze autumn colouring delighted me both in the rock garden, where it hung over big stones, and especially in some fine old stone vases; but hard winters killed it, and I have never been able to get it to grow strongly again, I shall keep trying to do so, as the Pheasant’s-tail Grass as it is called – goodness knows why as it is no more like a pheasant’s tail than a pig’s – is one of the most beautiful of all light Grasses. My Garden in Summer (1914) Chapter XII ‘Grasses’ page 235, E.A.Bowles. I imagine Bowles’ specimens looked gorgeous – anemanthele is stunning given either height to swoon or something to drape over. 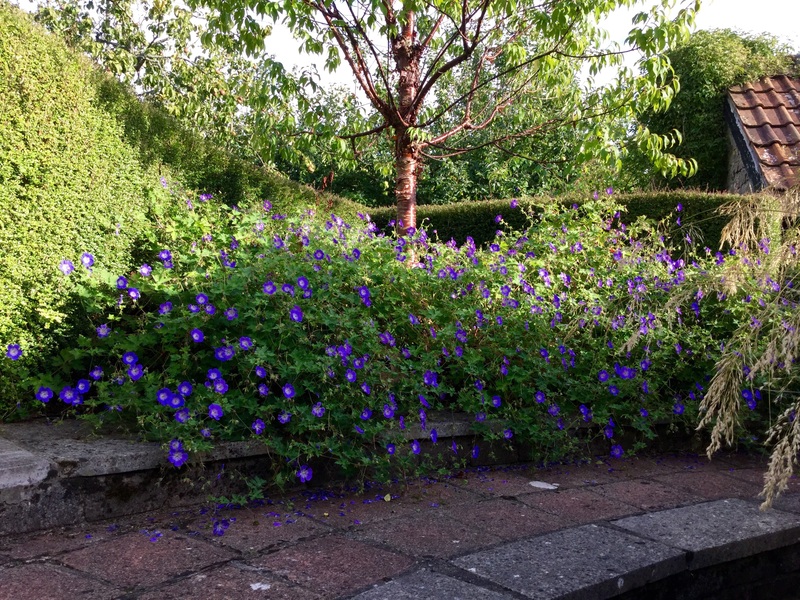 Those I grew interspersed with Geranium ‘Rozanne’ softened the edge of the wide terrace steps, it was a sight that made me smile. Inevitably, I lost them too, to old-age not bad winters. In summer the solo display of the geranium under the Prunus serrula is enjoyable, however, it was the evergreen grass that carried this spot through the winter. With ‘Rozanne’ flexing her muscles, it’s unwise to reintroduce immature grasses : I tried, they got swamped. The serendipitous combination worked because both were planted at the same time. A century has passed since Bowles lost his Apera arundinacea. Assisted by climate change and the observations of gardeners’ friends like ‘Gussie’ Bowles we’re able to grow plants like Anemanthele lessoniana with a much better chance of success. So much so, that it’s possible to experiment with new ways of using them. I’m enjoying Allison Reid’s Frogend Dweller blog and it was her post Phases of the Maze that piqued my interest in E.A. Bowles. It’s fascinating reading with inspiring images of the incredible Pheasant’s Tail grass maze in Cambridge Botanic Gardens. Bryan Hewitt The Crocus King : E.A. Bowlesof Myddleton House (Rockingam Press, 1997) with a forward by Brigadier Andrew Parker Bowles OBE. There is an Internet Archive for the complete text of My Garden in Summer 1914. A great post Kate. 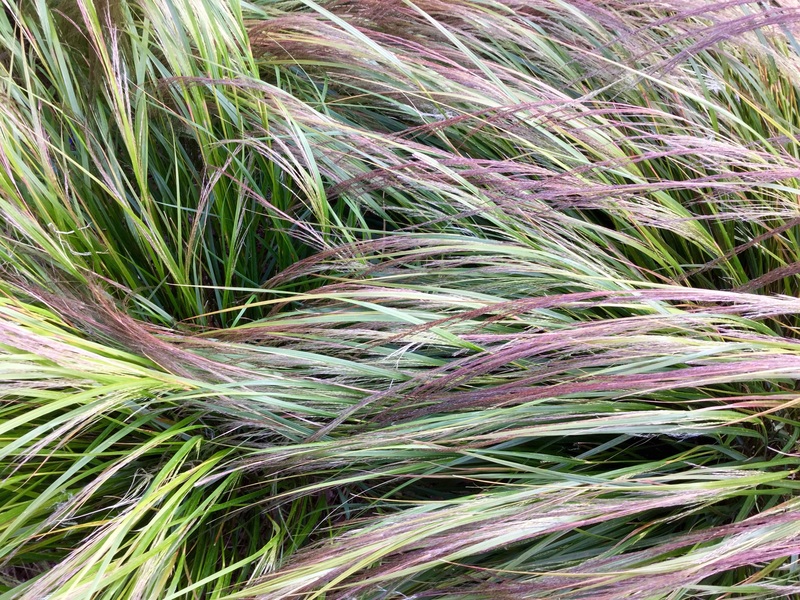 They don’ t really look like Pheasants’ tails, but what a lovely grass. I love his books and the descriptions of his plants. I visited Myddleton House earlier in the year and there are still plenty of unusual and interesting plants growing there. Thanks,Liz. Myddleton House gardens is on my ‘must see’list and I’m looking forward to reading the other two volumes of ‘My Garden …’ too. Fascinating, thank you, do you think it might be drought tolerant enough for me? 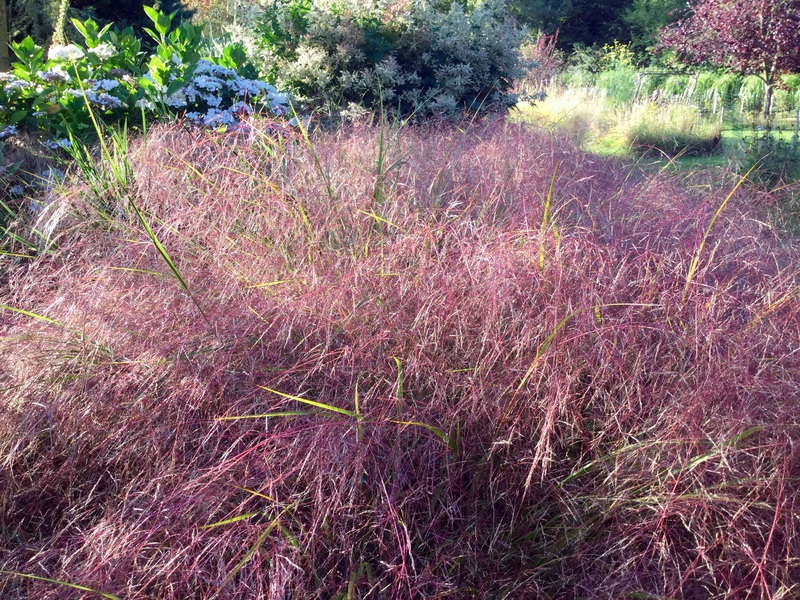 I grow Stipa gigantea and Stipa tenuissima seeds itself happily everywhere. I didn’t realize it was so easy from seed. It may well may suit your arid summer conditions, I know it grows in California in dry sunny sites with more orange leaf colour. I think there are a couple to choose from ‘Autumn Tints’and ‘Golden Hue’ though mostly in the UK sold as generic A.lessoniana. It is a lovely grass, but I have to be strong with it and pull out unwanted seedlings which are turning up in most of the borders now. I know what you mean. Luckily, we don’t need to be “strong” to weed it out where it’s not wanted.😉 Not composting the seed heads helps too. Great post. I had that grass for several years and now it’s disappeared even though it seeded itself far and wide. 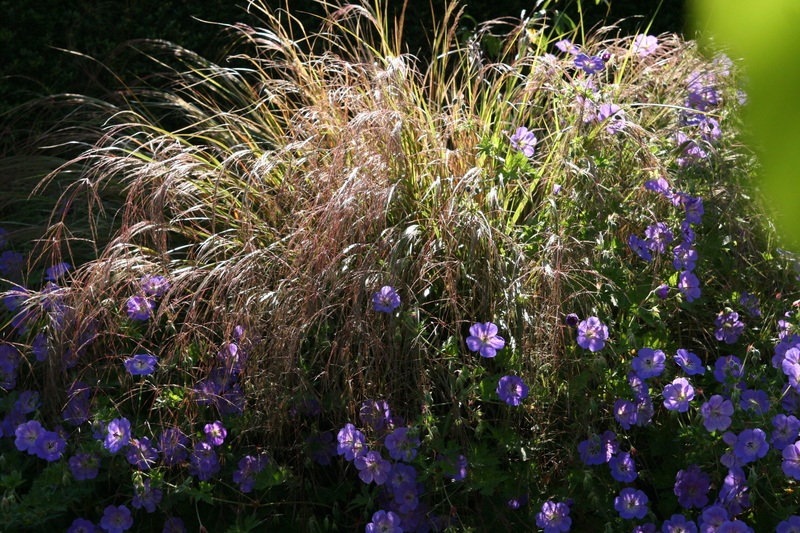 I like the idea of combining it with a blue geranium so might find a space for just that combo. That’s good, I hope you enjoy it too. 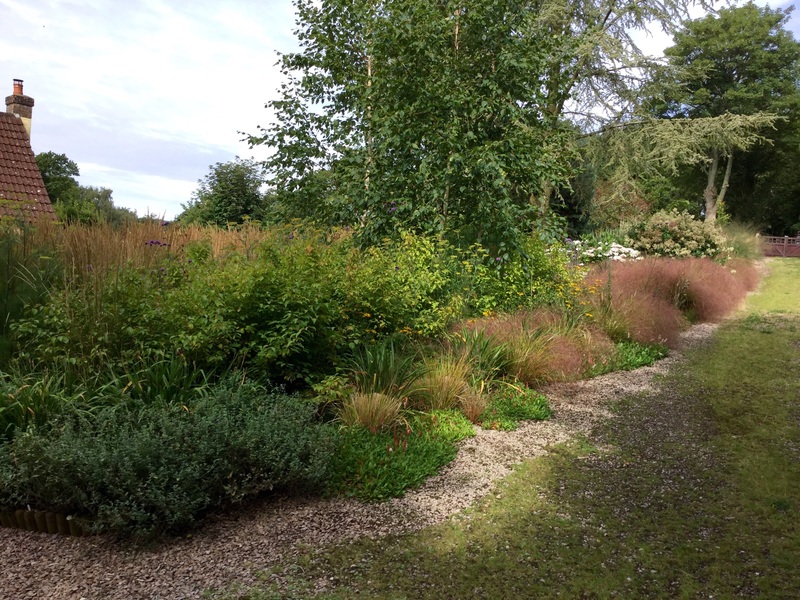 I found that young plants associated well together, the mature Rozanne elbowed later grass seedlings out of the way! This is a very enjoyable piece Kate. I love the Rozanne/Anemanthele lessoniana combination. Also that observation about the grass lassoing passers-by is so true. My plants are in their second year and are happily looking great, so thanks for the advice about lifetimes and getting replacements ready. Thanks, Allison. Look out for seedlings to pot up next spring or surface sow seed in the autumn. Fab post! I have a specimen at it’s peak at the moment tumbling out of a raised bed. I’m not so sure about it’s resemblance to pheasants but then the world of plant names is often one of puzzlement. Mine self sow happily in my brick path – I’m currently extricating the seedlings and potting them up. They make a decent size clump in no time. I do love those moments when plants combine in such harmony. It’s quite sad when the time is over and one dies or they outgrow each other. The positive spin is that it’s always another opportunity to do something else. Oh how I agree, a wonderful thing about gardening is the constant change and flux, then, no matter how hard I plan nature often does it better. I’m loving your blog, Kate. The stories of the house and the garden are a joy to read. 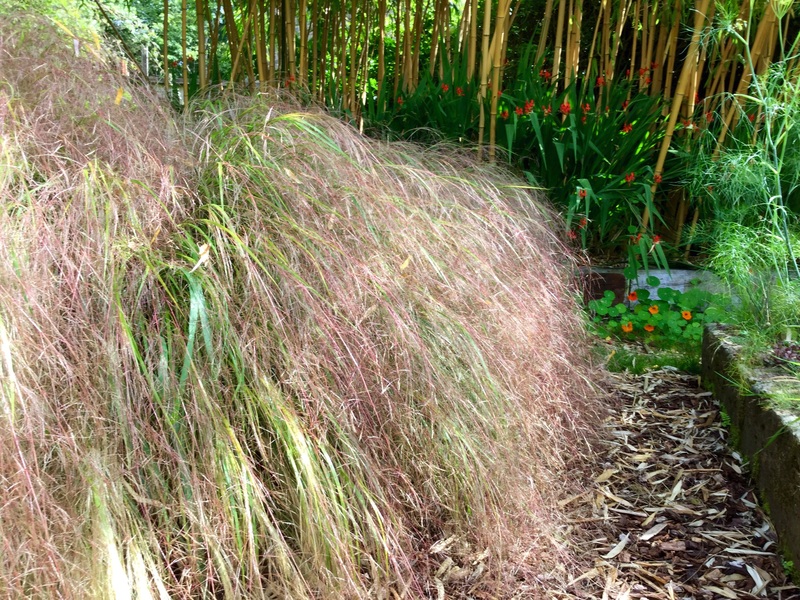 Your ornamental grasses (can grass be pluralized?) are terrific. Methinks its in the first photo that I see a resemblance to the pheasant feathers. 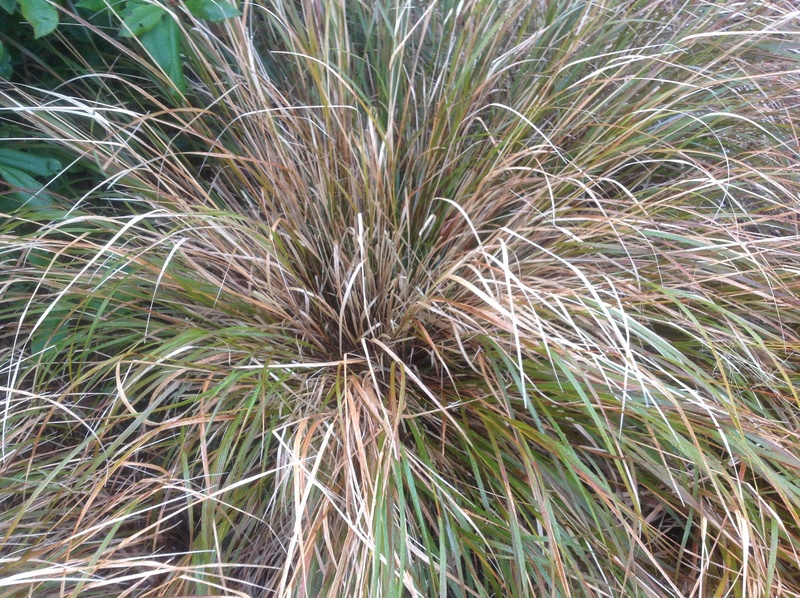 I also like ornamental grasses, though I have had two different problems: one of them takes over the garden bed, and the other (zebra grass) has taken years to look like anything. We moved it this spring to face west and now it is finally taking off, thank goodness. Thank you Cynthia for following the blog and writing, you’re quite right it’s “grasses”. 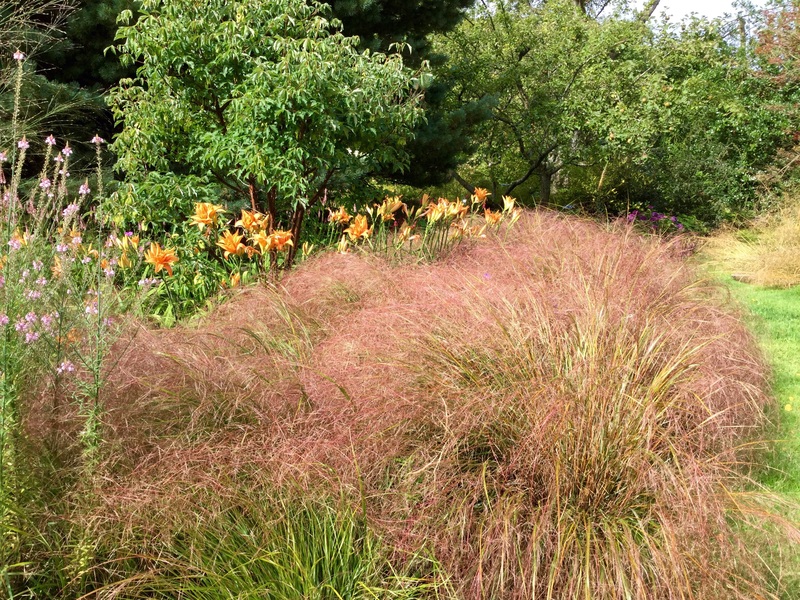 Grasses from warmer climes like Miscanthus sinensis ‘Zebrinus’ take a few years to establish in our cooler climates. Variegated ones rarely flower in my garden (which is fine) but just shows how far from ‘home’ they are, others from cooler climates as you say may seed too freely! Just like any perennial? I said I would pop over and here I am – I have had a quick look round the blog and have enjoyed what I have seen and read. 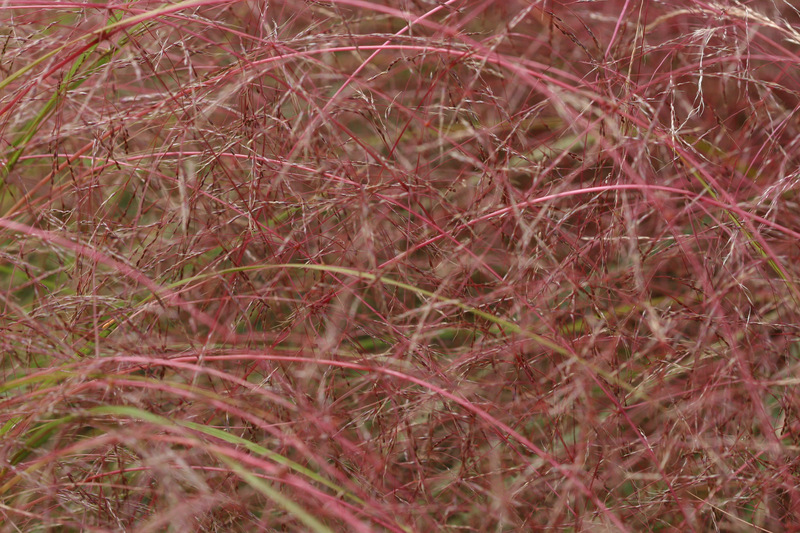 As a newcomer to most grasses I am confident I would learn a lot from you. Coincidentally I have just been reading ‘The Transplanted Gardener’ by Charles Elliot and he had a chapter on Bowles which made for intriguing reading! Looking forward to visiting again! Thanks for stopping by and for following the blog, Cathy. I shall add Elliot’s book to my list, sounds interesting 😊. Me too, they’re fascinating and Bryson’s humour has me in stitches – like the chapter on bears in ‘A Walk in the Woods’. I see it’s been made into a film. I have just found your blog via Helen. 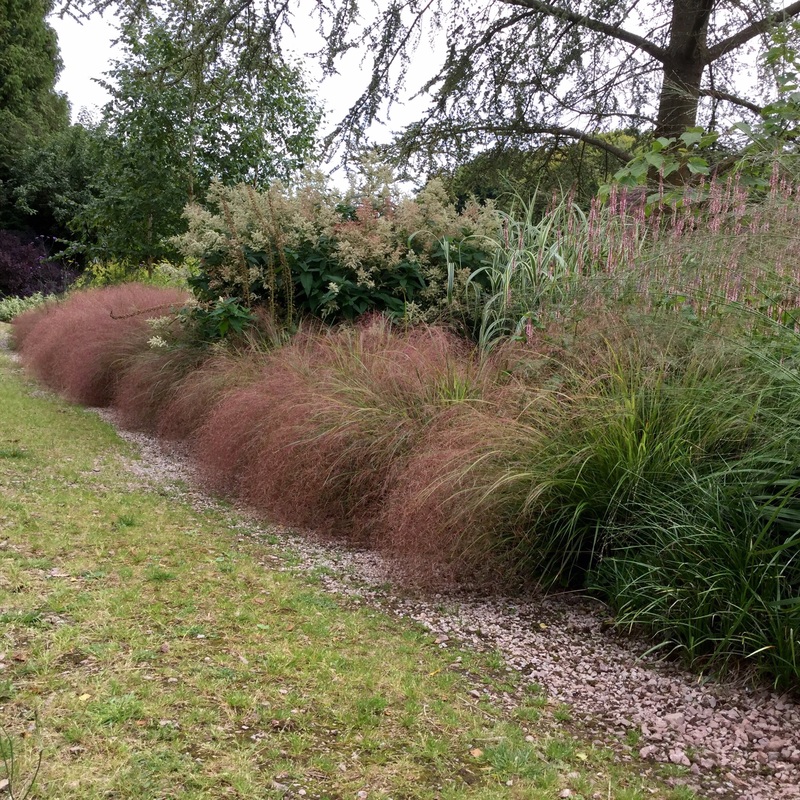 Pheasant tail grass has long been a favourite of mine, I have learnt a lot more about it from your post. I must look out for your NGS open days. Welcome Brian, and thank you for following Barn House garden website. The garden is open for the NGS by appointment until the end of September. Next year we’re delighted to be opening with a nearby garden, Greenfields. Hope to meet you one day!